" This innovation is provided by Investment and One-Stop Integrated Service Dept." 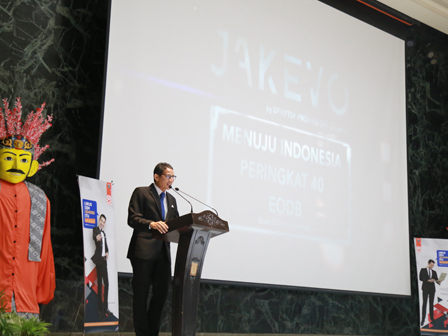 Jakarta Provincial Government launches Jakarta Evolution (JakEvo) application. This application facilitates people for Business Permit (SIUP) and registration certificates (TDP) administration. Jakarta Vice Governor, Sandiaga Uno conveyed it is an innovation to provide a fast, simple, and easy permit administration service. "This innovation is provided by Investment and One-Stop Integrated Service Dept. It should be appreciated," he expressed after launching JakEvo application, City Hall, Monday (5/7). He explained, usually it needs two days for SIUP and TDP administration but now it can be processed in hours or even just minutes. It is hoped can improve Indonesia's Ease of Doing Business (EoDB) ranking into the top 40 of the world. "Jakarta is one of Indonesia's provinces as main sample or contributes 78 percent in Indonesia EoDB index measuring," he explained. According to World Bank, he added, Indonesia's EoDB ranking in 2018 is up from rank 91st out of 190 countries into rank 72nd. "We'll continue to do various reformations and innovations to give an easiness for businessmen," he stated. For information, JakEvo is a website-and-mobile based application. This application can be downloaded through Play Store or jakevo.jakarta.go.id.website.